Work on the diorama has slowed a bit, but I haven’t been slacking since the last update. 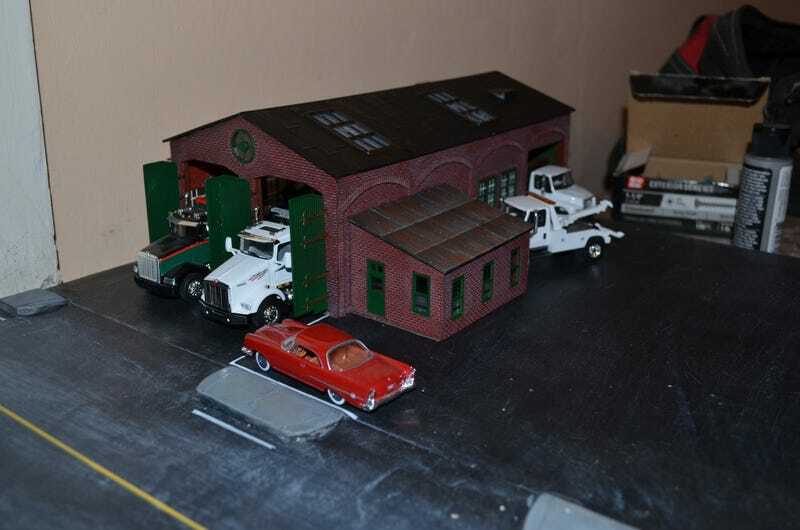 Mostly I have been working on getting the tow yard garage painted & built. The brick walls were given multiple washes of grey acrylic and black ink until I got a color I liked. The windows & doors were painted flat green. The main roof was painted flat black, then drybrushed with rubber brown(with rust on the skylights), and the small roof was painted flat black, brushed with flat steel while it was still wet, then later drybrushed with rust. Overall I’m really happy with it, though I think I need to dirty up the big doors some. I still have to build some door stoops, and make a fake rollup door for the extra garage door I cut out of the back. Amusingly, since I bought this building in November the tow fleet has gotten big enough that I almost need a second one to house them all.